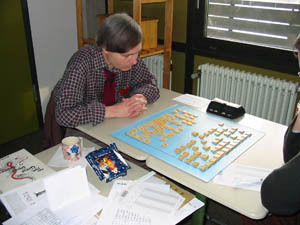 First weekend in February we met in Erding near Munich for our first event for the Chu Shogi Grand Prix 2006. We were guests on the 9th Erding Go Tournament with more than 80 participants. Special thanks to Bavarian Go Association and Erding Go Group. Our 5 guy group looks very small but fine. All games will be published on internet until end of February. We have to discuss the aspect time. We like this time mode 20 min (every 40 moves) / 60 sec Bronstein byoyomi. But it is not possible to play a 8 hour game on Sunday in a normal tournament witch finished at 3 pm. So may be we change to 15 min (every 40 moves) / 45 sec Bronstein byoyomi (perhaps only for Sunday games). So games with 2 x150 moves can be played in 5 hours and 8 hour games (with long time) will be finished 2 hours quicker.